Glad to see your up n running- mine just got a nose job to correct the PO butcher job- looks great- wish it wasn't so far down the "Things to do list." Might consider another oil change after having all the innards exposed like that. Finally got the Thing running again this week. I got a valve cover on wonky and had a bit of a leak initially, but it looks to have been resolved by resetting the cover. With welding up a few more rust holes, I think the exhaust sounds a bit better, too! Well I had a goal of getting to drive the Thing to the softball game today. Ain't gonna happen! Darn it! One thing that was missing from that shopping list pic from May, I just discovered, is the crankshaft oil seal! Why would a full gasket set not include that? So frustrating. 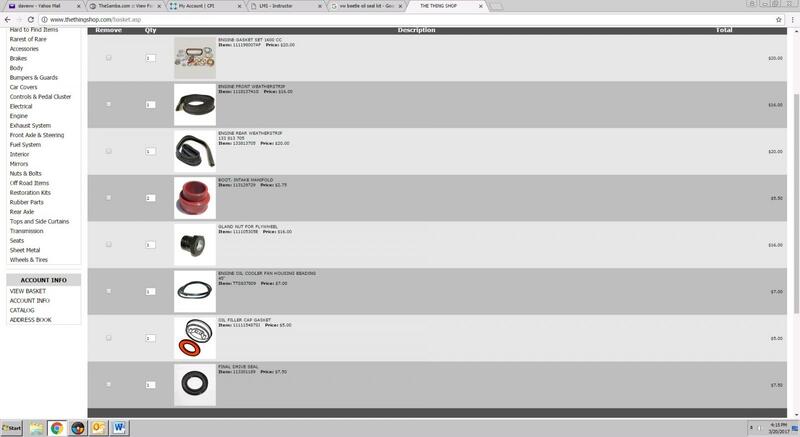 So if anyone else is thinking they will tear apart their motor and replace all the oil gaskets and seals, please add that to your shopping list or you will be similarly disappointed. The FLAPS will have one tomorrow so I will be able to proceed then. Oh well. As far as the exhaust, I did disassemble the system, welded up a couple more tiny holes (what seemed to work best was to cut a small piece of sheet metal to cover it, and weld on top of the sheet metal. Otherwise it would blow through easily), and welded some pieces of pipe to the flanges for the tail pipes, as those were rusted pretty badly. I also welded up the EGR port. I also discovered that the engine gasket set only comes with 4 of the exhaust gaskets, where you need six, at least with a Thing exhaust setup. You need two more for the back pipe to muffler flanges. 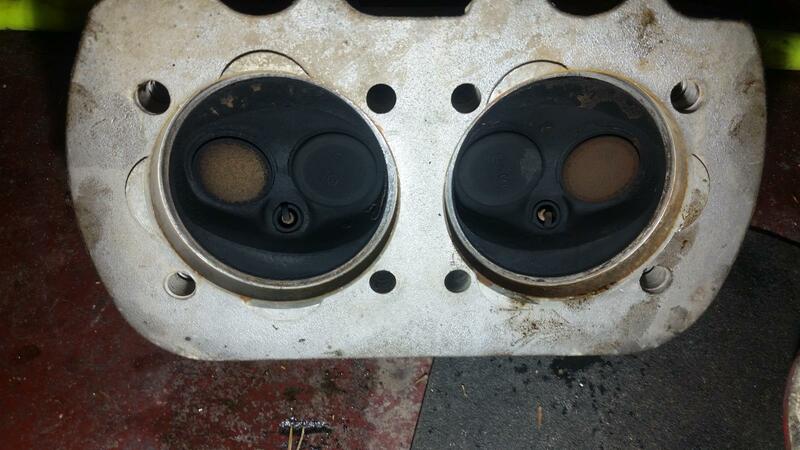 I ended up using some exhaust silicone sealant on two decent gaskets. I think in the end, the exhaust should be quite a bit quieter. Can't wait for that seal to come tomorrow and possibly get the engine in. Though I had talked about going to the lake with a friend, so I guess we'll see if that happens. Oh, and good tip on testing the push rod tubes for leaks. I'll do that. A couple weeks ago, I installed a hot water hose bib on my house. 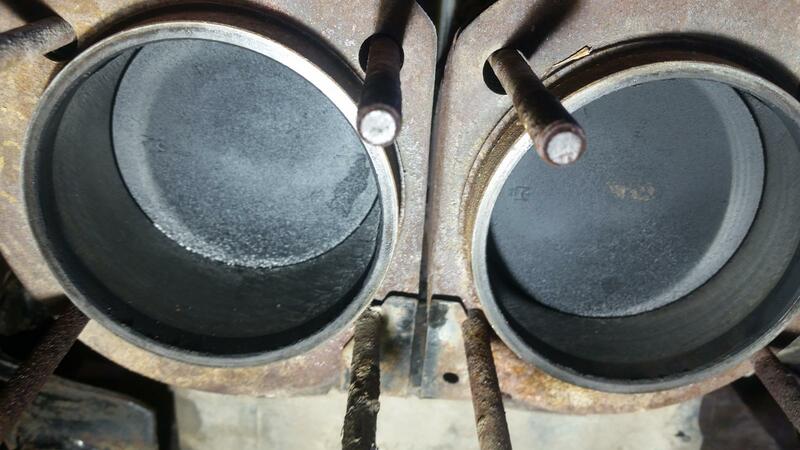 So with some mineral spirits and degreaser, the blazing hot water was able to melt through a lot of the gunk and grease. If at all possible, I highly recommend installing a hot water hose bib! I also built a free-standing shower that I can supply with garden hoses. So I can clean up outdoors without getting the tub all greasy after projects like this. thats a satisfying pile of parts. 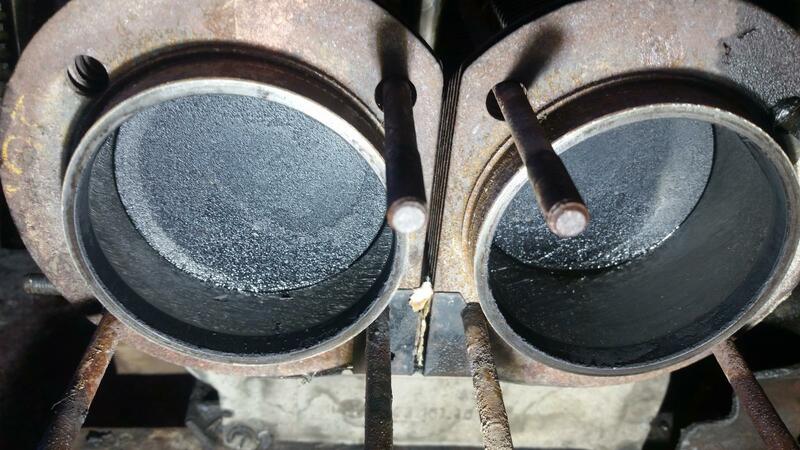 you might want to bag that oil cooler as contamination there is just as bad as your engine block holes. soak those PR tubes over night in gas - then run a brush thru them- I put my thumb over one end an blow in the other to see if they have cracks. First cylinder to head sealing in an old motor I ve seen in a long time. As far as the h studs go- put some sealer on them and screw them back in. Ya know- new AA 1600 piston and liners are under $150. Thanks! 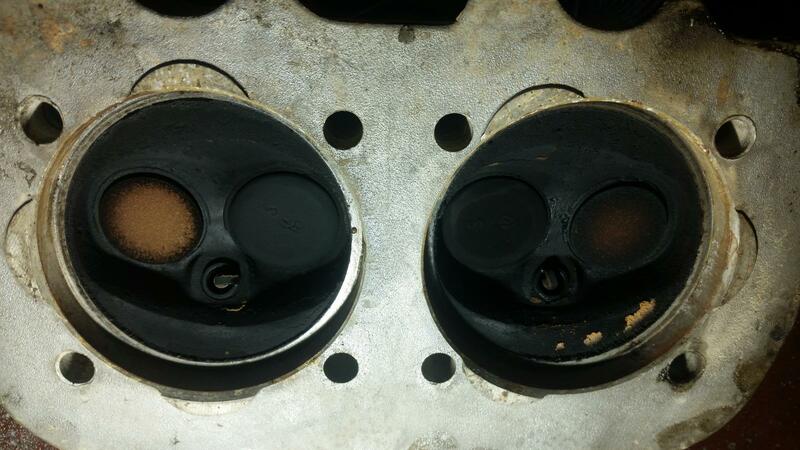 I guess you're saying that the cylinders look to have been sealing well to the heads. Yes, I was happy to see that there wasn't any leaking/damage there. Everything came apart without too much drama. The only thing is that one exhaust stud broke off at the head. I first tried the heat and wax trick to loosen it up, but that didn't work. It just broke closer to the head. I tried welding a nut several times but it kept breaking off at the weld. So I think I'll have a machine shop get it out at this point--I don't want to damage it. 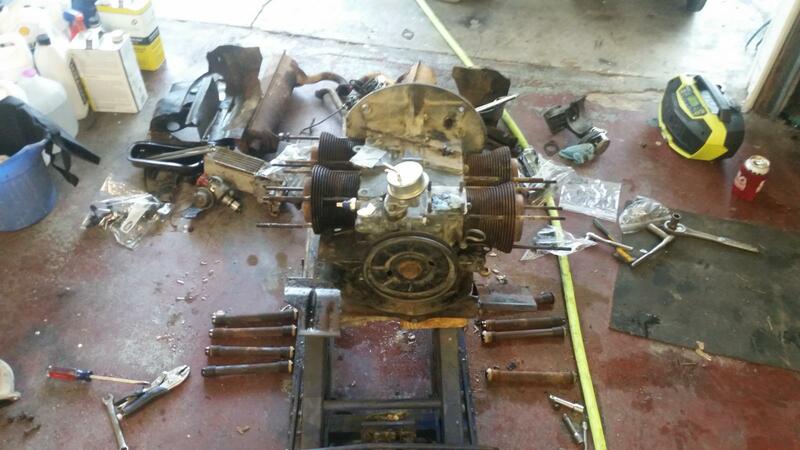 Anyway, got the motor out and largely torn apart this afternoon. Now I have a few questions. First, while removing the heads (to do the pushrod tube seals) two studs came out of the block. They are both the upper front studs on either side. Is this a big deal, or can I just screw them back into the block and and torque it down? Second, it occurred to me that I don't seem to have any thermostat bits. Did Things possibly not come with a thermostat, or did a PO get in there? Third, there isn't an actual oil seal behind the rear pulley is there? Finally, do you see anything concerning with the following head or jug pics? Note the large puddle and general mess. This was the impetus for the whole project. How it sits in my garage at the moment. So I think for now, I'm going to just drop the engine and reseal it. Maybe I'll get lucky and find that torquing down the heads after doing the pushrod tube seals will bump up my compression on the one cylinder. 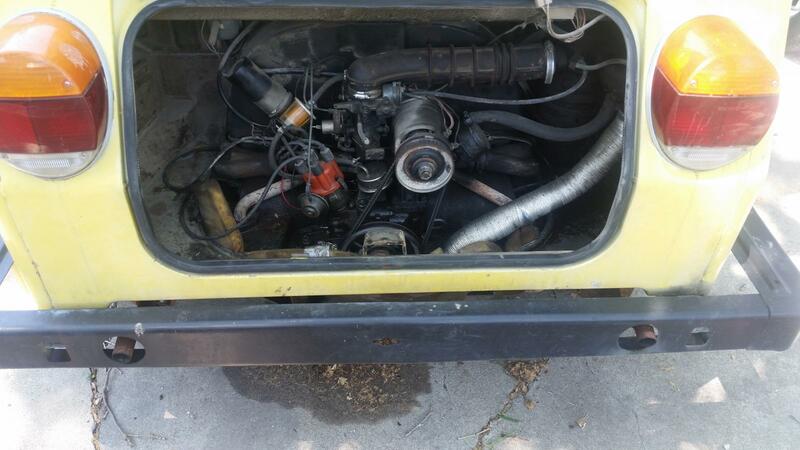 However, unless I find something really ugly, I will just seal up the motor and call it good for the summer. It is leaking way too much to be able to drive it this summer without risking further damage. For now, I want to just get it to where I can drive around town in the summer and not worry about that. It has been a while since I've done much of anything with a Type 1 motor, so I want to make sure I've got everything coming. I want to drop the motor and replace every oil seal I can without splitting the case. Also will replace the input shaft seal on the transmission. If I remember my T1s correctly, I'll have to remove the gland nut to do the seals on the flywheel, and the gland nut will have to be replaced, right? It looks like from the pic that the needle bearing is a part of the gland nut. Is that correct? Does this look like a good shopping list? Is there anything not included in the 1600 oil seal kit I would need? Did I accidentally add anything that IS in the 1600 kit? Here is my shopping cart so far. Looking for any other suggestions of "while you're in there" stuff I didn't think of. I will add a clutch kit. Yeah, I suppose the "stock" option is probably quieter, though that also likely depends on whether or not the innards of the "stock" mufflers are the same or similar to factory, as well as what the innards of the Thing Shop mufflers are like. This one, from the same search looks decent, but still $$$. Would be close to the same cost as the Thing Shop if I had it powder coated I guess. I wonder which one is quieter? That would probably be my deciding factor if I bought something new. I'm not one for loud exhaust systems. The link above would be the 'quieter' option, as it is basically stock. I have the Tri-Mil header on my vehicle, definitely loud, but at the time I purchased my vehicle, it was the only option outside of using the Type 1 / Beetle 'pea shooter' exhaust system. Plan this year is to replace the Tri-Mil with the stock set up, I have a 1973 Thing. saw that 2 piece- "real money" exhaust system like you have so maybe trying to coat your might keep it safe for a while. i saw some mufflers at "the thing shop" which were quite reasonable.- like less than $150. depending on your use- it might be time to do it. once down to the oil cooler- your a few screws away from total exposure. Just went there and not a muffler in sight- was round "black friday" I saw them- must have been a lost leader- Should have bought one then suppose. Clip 1 has the muffler for $115- but then want $80 for the 2 tailpipes.- If you can rescue tail pipes - it might work. Empi makes one for $135. They are the original mufflers that were installed in 1973 I'm sure. So they are two completely separate mufflers and the tail pipes do exit through the bumper. The original mufflers on my first '73 where shot when I bought it in the fall of 1977, so I would doubt yours could possibly be original. It came from Dallas, and sat in a barn for 25 years. So it seems possible to me. I think there is a VW logo stamped on them, but I'd have to check for sure. You sure? I do not see any mufflers on their exhaust page, and searching "muffler" yields no results either.